Service Costs > How Much Does AmazonFresh Delivery Cost? How Much Does AmazonFresh Delivery Cost? AmazonFresh offers same-day delivery of a wide selection of items, which include fresh grocery and local products. This service is available only in certain San Francisco zip codes, the Seattle area, New Yorck City, the Philadelphia area, and Southern California. However, AmazonFresh is working on expanding to other areas throughout the United States. How much does an AmazonFresh membership cost? According to Amazon.com the cost of AmazonFresh is available to Prime members only for an additional $14.99 per month. If you spend less than $50 on an order, even with an active subscription, you will be charged $9.99 for each delivery. Also, in addition to the Amazon Fresh Add-on, you will also need an Amazon Prime membership for $99 per year. According to GoBankingRates.com, the cost of AmazonFresh is $14.99 per month, in addition to the annual $99 Prime membership. The website says the service may be worth it only if you have a Prime membership and use the service regularly. 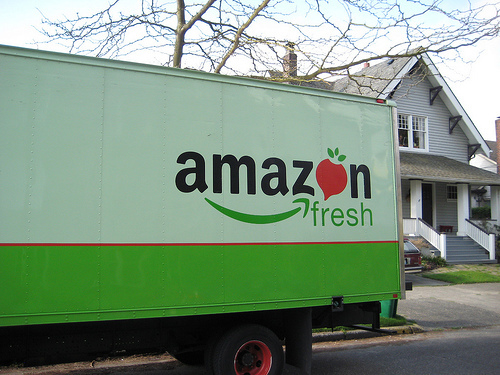 AmazonFresh offers two delivery options: Attended Delivery and Doorstep Delivery. Most clients use the Doorstep Delivery option. With the Doorstep Delivery option, one gets to choose a three hour time window which works best for their schedule and one does not even have to be at home. AmazonFresh leaves the items on the client’s doorstep in temperature-controlled tote bags which it then picks up on the next delivery. With the Attended Delivery option, one gets to pick a one-hour appointment whenever you will be at your home to receive the deliveries. Some benefits of Attended Delivery include shorter one-hour delivery windows, no totes or other shipping supplies to store at your home, in-person delivery straight to the kitchen, delivery to buildings with secure entries or limited access, and alcohol orders with your delivery. Alcohol orders are not allowed for doorstep delivery. Aside from ordering directly from Amazon, you can browse and order from more than 1,000 items at a local Whole Foods store. Items ordered through AmazonFresh are available for home delivery either on the same day or next day, depending on the time of the order, as well as the availability of trucks as well as your availability for delivery. AmazonFresh currently services the greater Seattle, San Francisco, and Southern California areas. You should check your address to see whether it is within their delivery area. AmazonFresh will not deliver to dorm rooms. If you want to see how the service works, Poorer Than You created a nice review of the service. Eligible customers who are not Prime members yet can sign up for a 30-day free trial with the Fresh Add-on. AmazonFresh isn’t the only service in town, so be sure to compare other options like Instacart, Shipt, Google Express or your local grocery store. All of these service providers, just like AmazonFresh, may not be available in your area. Be sure to check out the Fresh Deals page for the weekly promotions.